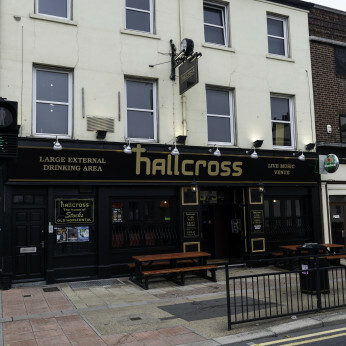 The Hallcross is situated in a prominent location at the top of one of Doncaster’s main streets. We have recently completed an extensive series of renovation works to bring you the best in everything new as well as paying homage to the history and traditions of this great Doncaster institution. The front is very much a traditional pub, with six hand pumps taking pride of place and lots of comfortable seating, the rear area is now a totally separate sound proofed live room with bands every weekend. The pub used to be a mainstay of the Doncaster real ale and music scene. We have tapped into this great legacy to bring back the very best that Doncaster has to offer. In terms of real ale, the Hallcross was famous for brewing it’s own beer at a time when such things were very rare. We have now reinstated the original beer, as a result Stocks ‘Old Horizontal’ is available again for the first time in over twenty years. Look out for more in the future. As a live music venue it was renowned for being the centre of the Doncaster rock scene with many local bands having there first gigs here. The venue has been greatly upgraded for the modern era with all the latest sound and lighting equipment in the dedicated gig Room. The entrance closely is guarded by our famous Lemmy mural. There are outside seating areas at the front and the rear. The rear terrace is the perfect place to enjoy a drink in the sun and while away those long summer evenings or if you prefer you can stake a place at the front and watch the world go by. We have Sky and BT Sports to show all major sporting events and we also have TVs outside to enjoy sport in the sun. We have everything you would expect from your traditional local with special events, regular quiz nights, (every Wednesday) and chatter and banter from a diverse and electric bunch of friendly regulars.